Friday, April 26, at Urbana Dance Company, the second 50/50 swing and blues dance. Lesson 8pm. Dance 8:30 to 11pm. This one will be DJ'd with both swing and blues music. Students $8, Community $10. RSVP on Facebook. Our familiar routine with our dance friends. 6pm Lesson. 7-9pm dancing. Every Monday including this one. All levels welcome. No partner needed. Urbana has awarded an arts grant to bluesCENTRAL to support a free-to-the-public music, learning, and dance event this fall. Thanks and congrats to Jennifer White who led this application process and all who helped. More info to come soon. There's still time to register online until Friday at Noon. Then the prices go up and registration will switch to at-the-door only. If you or your friends are the last-minute type, now's the time to register. Invite your friends to the SnowMELT Blues social dances: the 50/50 Blues/Swing Dance on Friday night, Susan Williams Band on Saturday Night at Neil St Blues, and to our main dance at Channing Murray following that. See the full schedule here. Respond going on the bluesCENTRAL Facebook event for the 50/50 dance. Our venue, the Urbana Dance Company also has an event for it, hit going on that one too. Kate Barton is coordinating volunteer signups for SnowMELT. She has some more spots to fill. Visit the volunteer sign up page to help out. We are excited that Travis Hartman is coming form Dayton, OH to DJ at SnowMELT. Monday, Guido's, 6pm — Sierra will teach on generating your own ideas for repetition and variation. Then our usual social dancing from 7-9pm with the bluesCENTRAL friends we love. Jennifer will DJ. No partner required. Monday, Guido's, 6pm — Dave will teach our lesson this week, focusing on musicality by listening to specific songs and suggesting elements to reflect in our dancing. 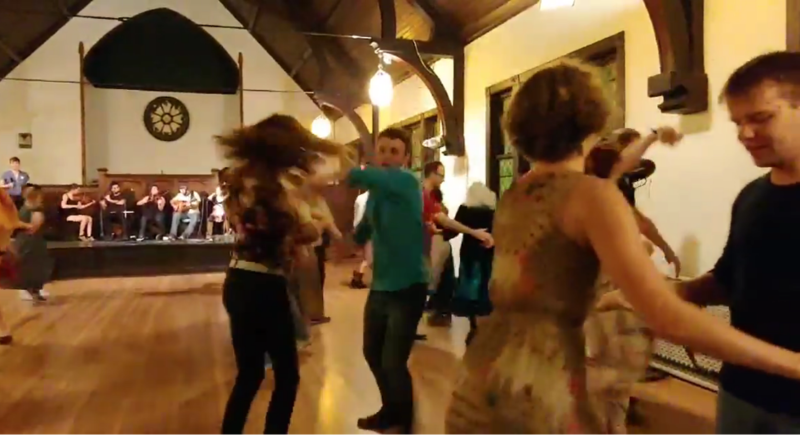 Social dancing 7-9pm. No partner required, come on out and dance. Kate Barton is coordinating volunteer signups for SnowMELT. She has some more spots to fill. Visit the volunteer sign up page to help out. Thanks! James Cotton was born in the heartland of Delta blues, in Tunica, Missisippi. But it was listening to Sonny Boy Williamson II on radio that inspired him to leave home to seek out Williamson’s mentorship. James initial instrument was the drums but he is most famous as a harmonica player. By the early 1950’s he played with Howlin’ Wolf and in 1955 moved to Chicago to join Muddy Waters band. Playing with many great blues artists of his time, he evenutally formed his own band with Otis Span, James played in the Delta, Memphis and Chicago styles of blues. James died of pneumonia at the age of 81. We’ve upgraded the Saturday Night Main Dance to a larger space to make room for all the dancers who’ve registered for SnowMELT Blues. The beautiful Channing Murray chapel, beloved by C-U dancers, will now be our venue for this dance. Saturday, March 30th, 9pm to Midnight. With this change to a larger venue we’re also opening this dance to the community with an at-the-door price of $8 ($5 for students). It’ll be sweet. Our Saturday Night Dinner & Dance with live blues music from the Susan Williams Band will still be at Neil Street Blues from 6-9pm. Chris Dove is planning to join our Monday night lesson and dance at Guido’s Basement Bar this week. Come meet (and dance with) the instructor who will be teaching all 7 workshops at SnowMELT Blues. Read her dance bio on the SnowMELT page. Sierra and Dave will continue their lesson series, this week focusing on… TBA. Don’t forget to register for SnowMELT before the early bird pricing ends, and sign up to volunteer too. Jennifer has curated this week’s playlist featuring swamp blues artists including Lightnin’ Slim (1913-1974), Slim Harpo (1924-1970), Clifton Chenier (1925-1987), Lazy Lester (1933-2018), Katie Webster (1936-1999), Marcia Ball (1949-), Tab Benoit (1967-) and other contemporary artist who have played swamp blues influenced songs. Swamp blues began in the 1950s and 60s around Baton Rouge and is a sub-genre of the jazzy and Afro-Carribbean influenced Louisiana blues style. Swamp blues has an eerie echoing reverberating sound with trebly guitar, wailing harmonica and sparse but unique percussive effects. Zydeco, Cajun, and soul influences are also recognizable. It can have lazy shuffling beats as well as boogie rhythms. The style was also adapted by British Invasion artists such as Rolling Stones, The Kinks and the Yardbirds but swamp blues popularity faded in the 1970s. bluesCENTRAL Weekly Lesson & Dance events are now hosted in the basement level bar at Guido’s. We loved the new digs last week, it’s a great space to chill, eat, and dance. We will *not* be meeting at Cowboy Monkey for a few months because they are remodeling. If you want to eat before the lesson, a bartender will be on hand at least 30 minutes ahead of time to take your orders. This week Sierra and Dave continue teaching lunges. We’ll work on integrating lunges with other moves and the music. Our dance playlist will be a selection of Jennifer’s personal favorites. Registration for our regional blues dance weekend in Champaign-Urbana is open. Early bird prices are active. Let’s go! We’re moving! Starting this week, bluesCENTRAL Weekly Lesson & Dance events will be hosted in the basement level bar at Guido’s. We will *not* be meeting at Cowboy Monkey for a few months because they are remodeling. Come to Guido’s this Monday. Sierra and Dave are back to teach the lesson this week. They’ll teach lunges, including some discussion of musicality and ending a phrase, and a combination of moves that uses a lunge and some of the walking techniques we’ve been working on. Jennifer has curated another special playlist for us this week. Muddy Waters (1913 or 1915-1983) is known as the father of Chicago blues. Having grown up in Clarksdale, Mississippi playing harmonica and guitar, Muddy was influenced by the acoustic sounds of the Delta blues style of Robert Johnson and Son House. Muddy drove a tractor on a plantation by day and ran a juke joint by night where he sold moonshine and played his music, developing his own musical style. He was first recorded by Alan Lomax in 1941. Like many other African Americans moving northward in search of work in that period, Muddy moved to Chicago in 1943. 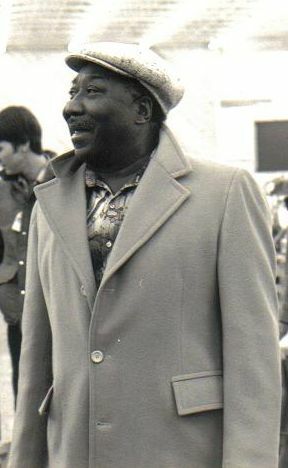 Muddy became played a pivotal role in the development of Chicago blues. Buying his first electric guitar in 1943, Muddy was one of the most prominent singers, songwriters and band leaders in the development of Chicago blues in the 1950’s. Chicago blues is rooted in Delta blues and characterized by the addition of electric guitar, amplified bass guitar and harmonica played on a microphone with amplifier. Drums, piano, and occasionally a saxophone are also often part of Chicago blues instrumentation. Monday nights playlist will feature the Chicago Blues hits of Muddy Waters.